What is Scientific method and what are the steps of the scientific method? 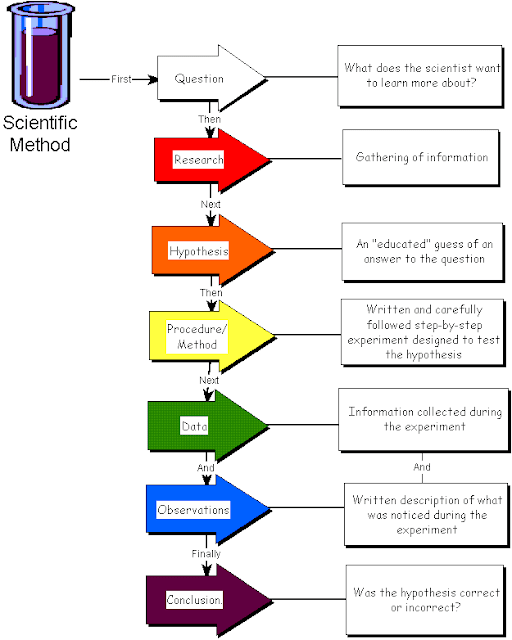 In this post we will discuss the scientific method and the steps involved in a scientific method. As we all know science is a process of acquiring knowledge. Is it simply gathering information or knowledge? We get a lot of information from newspapers, TV shows, magazines, even from our surroundings. These are all knowledge or data. How this is different from a scientific knowledge? The term science is derived from a Latin word ‘scientia’ which means ‘to know’ or knowledge. I will straight away give you a definition that will clarify things better. Scientific method is an organised and systematized effort to gain knowledge that uses observation and experimentation to describe and explain nature or natural phenomenon. It includes collection of data through observation and experimentation and formulation and testing of hypothesis. Here two terms stands out “systematised and organised” that is scientific method involves certain steps that is followed universally for getting solution to a problem. In short, scientific method is an organised and systematized or logical way of finding answers to questions or finding solutions to problems. Hope this much is clear. First of all, I will give you a brief idea about all these steps and in the next post we will discuss these steps with an example. Step I: Define the problem through observation. Make an observation. Based on the observation, frame a question that is Define the problem through observation. Keen observation of surroundings is the most important quality of a good scientist. A scientific enquiry begins with observation of a natural phenomenon. What makes an observation scientifically useful? It should be correct and repeatable. Observation can be direct using senses or indirect with the help of instruments. Now ask questions. Why, how, what?. Preliminary answers to these questions will help you to define the problem. Step II: Research the problem and formulate hypothesis. Research the problem: This step is often called as review of literature (collecting background information on the topic selected). This refers to the process of collecting all available information on that particular topic. This will give the researcher a clear cut idea about what to do next? And also helps in avoiding repetition. After extensive literature survey, the researcher will formulate a hypothesis. Hypothesis is an educated guess, a possible answer or a predictive statement that can be tested by scientific methods or scientifically testable or measurable. This statement is based on our previous experience on the topic or based on existing knowledge or review of literature. Step III: Testing hypothesis by conducting experiments. Here we have to design the experiment and execute the project. We often call the methodology adopted for conducting the experiment as procedure. It should be properly designed to get unbiased results. Step IV: Collect and record data. Data collection may be direct (using our senses) or indirect (using scientific instruments). Step V: Analyse and interpret data and draw conclusions. At the end of the experiment, hypothesis may be right or wrong. Step VI: Report results or theorising. This includes preparation of report or presentation of results or publish it in scientific journals so that your finding is open to public. A theory is a hypothesis supported by large body of observation and experimental evidences. All scientific theories are subjected to revisions or modifications. The above steps are followed in all research programs irrespective of the subject. A good research is systematic, logical, empirical, unbiased and replicable. The word empirical is widely used in science. Empirical means information acquired by experience (using our senses) or experimentation (using instruments). Science cannot answer any questions that are not empirical. Scientific findings are always under a state of flux, it can change. Once scientific world believed theory of spontaneous generation, later it was disproved. Now scientific community believes theory of evolution for the time being this is acceptable. But in future this may or may not be disproved. Till the discovery of microscopes, we are not even aware of a world that is so diverse, the microbial world. The limitation of humanity is the limitation of science. In science, we are trying to overcome our limitation of senses by developing instruments that allow us to go beyond senses. But the limitation persists and that is why science is a journey and not at all a destination. In the next post, let us have a close look into the steps in scientific method with the classic example, discovery of penicillin by Alexander Flemming.